Homemade Banana Pudding Recipe - A Hug From The South! 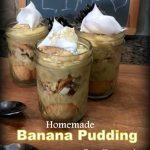 Homemade Banana Pudding – A Hug From The South! Our daughter came from the east coast recently for a long-overdue visit. Now although she currently lives on the east coast she’s got deep roots in Texas. Inside she’s a Texas girl through and through. She longed for some good ‘ole Southern eating during her visit. So I made banana pudding. She loved the homemade goodness! I simply used my vanilla pudding recipe and added the bananas and cookies. I’ll show my procedure to you here and I’ll share my recipe below. First I pulled out and measured all the ingredients. This makes it easier when the pudding is cooking to not have to stop & measure. Or heaven forbid leave something out! Ask me how I know… eh hem. Moving on! Even though there are packaged cookies in this recipe, this is a nice view of healthy wholesome ingredients – sugar, real butter, milk, flour, an egg yolk, a dash of salt and vanilla extract. Plus of course the bananas and cookies to make it the goodness that is banana pudding. I should note here that you can include up to 3 egg yolks to make a richer pudding – I usually just go with one though. Pudding is one of the easiest desserts to whip up and preparing the pudding was a snap. I combined the sugar, flour and salt and stirred together in my pan. Then I added the boiling water and the butter. After the butter melted I blended the egg yolk into the milk and poured it into the pudding and cooked until it began to thicken. When it was starting to thicken I mashed a banana and stirred it right into the pudding – I think it infuses the banana flavor nicely. When the pudding was as thick as I wanted it I pulled it from the heat, added the vanilla and stirred it in. Then I prepared the pudding dish. The dish was lined with cookies and I placed a layer of sliced bananas on the bottom. I poured the hot pudding into the dish and topped it with cookies. I usually like to crush the cookies and sprinkle them on top so it covers completely but on this day I simply placed a layer of cookies on top. When it’s time to serve I line a cute vintage wide-mouth 1/2 pint jelly jar with a few wafers and spooned the warm pudding in.Our daughter loved the pudding and it gave her a home-spun hug that she had been craving. At other gatherings when I’ve whipped up this banana pudding I’ve also served them in single-serve 1/2-pint jelly jars. I love the way they look. It was easy, I just layered cookies on the bottom and then poured in the pudding to fill about a third of the jar. Then I chopped some bananas and laid them on top of the pudding, added a crumbled cookie, and finished filling up the jar with additional pudding. A dollop of whipped cream and a sprinkling of crushed cookies on top and BAM! Now that’s a fun presentation, y’all! 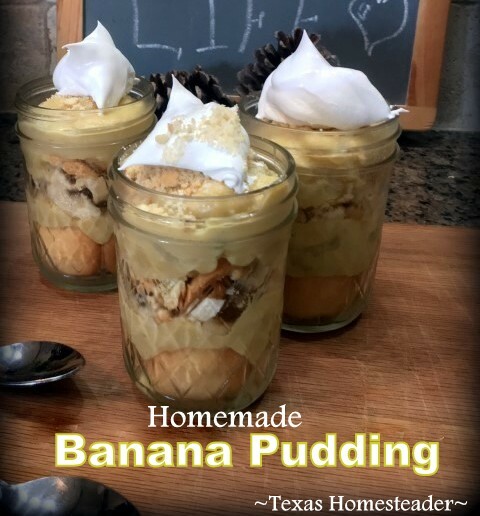 And now as promised, here’s my vanilla pudding recipe – simply add the bananas and cookies if you prefer a delicious homemade banana pudding. Enjoy! Good ole comfort food. Homemade Banana Pudding - could anything be better?? Mix sugar, flour & salt together in skillet on stove. Mix milk and beaten egg yolk together in separate container and pour into the pudding and stir. Continue to cook over medium heat until thickened. When pudding is thick remove from heat and add vanilla extract. Allow pudding to cool slightly - either serve warm or cover top of pudding with cling wrap to keep skin from forming and store in the refrigerator. OPTIONAL - For Banana Pudding, add chopped bananas atop a bed of vanilla wafers, ladle on pudding & top with additional vanilla wafers as desired. This entry was posted in Blog Posts and tagged Cooking, Environment, Frugality, Recipes on May 3, 2013 by Texas Homesteader. Oh yum! I haven’t had homemade banana pudding in years! My grandma always made it for family cookouts, but I’ve only made it with boxed. I’ll have to try your recipe! Thank you for sharing at Merry Monday! I have been wanting banana pudding for a few months now and keep forgetting to make it when I have time. Thanks for the reminder and recipe. Thank you for linking up with us for Fabulously Frugal Thursday. Lots 2 do today so here early before I start my day. Hubby loves banana pudding and if He had his way; he would sit and eat the whole bowl full. (he just doesn’t get his way. :} ) It has been so long since I have made this, and because I love him, it’s time to make him a nice big batch of one of his favorite desserts. Thank you and enjoy your day. This is a great concept, but when I get the Nilla wafers out, I end up eating most of them, with a bottle of root beer. Then I give the kids the bananas and suggest they make pudding for all of us. Don’t knock it – everyone seems happy. I LOVE your site and I LOVE this post! I am a TN, pure southern girl, living in Germany. Sometimes I need a HUGE dose of home and your site just did this for me! Especially the recipe. Reminds me of my mom’s banana pudding. I haven’t had banana pudding in a long time….this makes me want some now! Thanks for linking to TTF! There are very few things when it comes to food, that are better than Banana pudding. It’s not only one of my favorite things to eat, but I love making it and taking it to family parties during the holidays. Thanks for sharing your homemade version, I will have to try it. Thank you for linking up to Thrifty Thursday. I love the recipe and have printed it out to try when we next have bananas. I make banana pie with vanilla pudding because I don’t like the artificial banana taste and I know I’m going to love this whole foods pudding with banana even better! Definitely a staple in our southern family! Delicious! The banana pudding looks amazing! One of my favorites! I always make a meringue out of the egg whites and spread it over the top of my pudding , lightly brown in the oven. Makes or a pretty and delicious pudding. Oh YUM!! This looks great! This would be perfect to link-up to my new series – “Create It Thursday.” It’s live now! This sounds like the one a true southerner would make. Please send me updated posts my e-mail: Thanks so much!!! Pinned ! 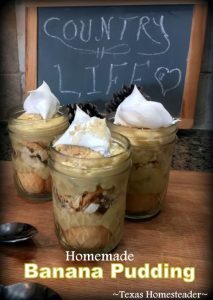 Love banana pudding 🙂 Thank you for sharing at our ALL MY BLOGGY FRIENDS party ! I love banana pudding! I have it every year instead of birthday cake! Fellow Texan here to say: YUM! Love us some banana pudding! Nilla wafers and banana pudding. Oh my word! I have to eat some! Thank you for sharing at our Pinteresting Party!